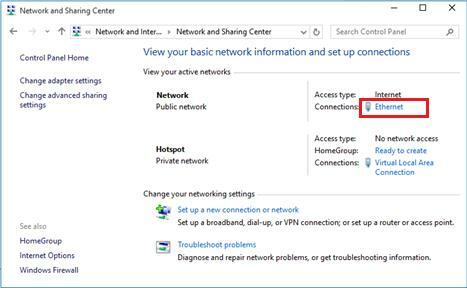 Like in previous OS versions, in Windows 10 user can create a software Wi-Fi hotspot (access point). This hotspot can be used for creating a local wireless network or sharing Internet connection (wired or cellular 3G / 4G connection) by several devices (smartphones, tablets and other devices). In the first releases of Windows 10, you could create and manage such a hotspot only from the command prompt. 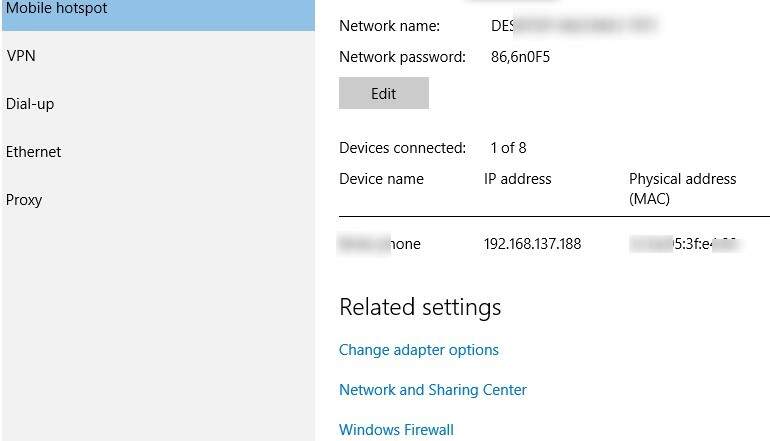 In Windows 10 1607 a simple graphical interface for creating an access point – “Mobile hotspot” appeared. So, today we’ll consider how to create a Wi-Fi hotspot (virtual access point) based on Windows 10 without additional third party tools. We assume that your system has two network adapters — a wired Ethernet network card (connected to a provider’s network) and a wireless Wi-Fi adapter. We want our computer with a Wi-Fi adapter to be usedas a Wi-Fi access point by other devices and share its Internet connection. Tip. Instead of a wired connection to access the Internet, you can use a 3G / 4G connection through a USB-modem or a phone. 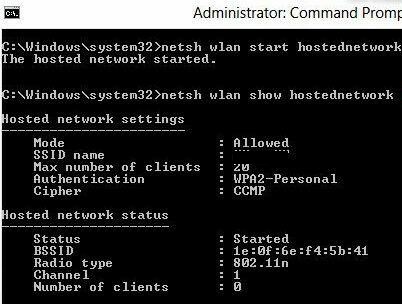 The command prompt window will display information about the Wi-Fi adapter driver used and the supported technologies (for details about the supported Wi-Fi driver standards, see How to Troubleshoot 5GHz Wi-Fi Not Showing Up in Windows 10). “Hosted network supported: Yes” message means that this driver supports access point mode. Otherwise, try to update the driver version or install another Wi-Fi adapter. In Window 10 1607 (Creators Update) a simple GUI for sharing the Internet over Wi-Fi appeared. This function is called “Mobile Hotspot”. Go to the Settings -> Network & Internet -> Mobile hotspot. To turn on the access point, it is enough to click the toggle “Share your Internet connection with other devices“. The name of the new Wi-Fi network and the password will be generated automatically (you can change them). Select the Internet connection that you want to share with other devices (Share my Internet connection from). If your computer has only one internet connection, it will be automatically selected. Therefore, you can’t share all types of Internet connections. For example, a PPPoE connection can’t be shared this way. In the same window, the list of devices that are connected to your WiFi hotspot is displayed. The name and MAC address of the device, as well as the IP address assigned to it, are displayed. As you can see, up to 8 devices can be connected to the access point on Windows 10 at the same time. If the error “We can’t set up mobile hotspot. Turn on Wi-Fi” appears when you trying to create an access point, try to update the driver for your Wi-Fi adapter and / or remove the virtual Microsoft Wi-Fi Direct Virtual Adapter according to the instruction. After that, restart your computer and try to turn on the mobile hotspot again. Another common error: “We can’t share this Internet connection because we can’t connect to the cellular network“. Just try to restart your Internet connection. Another error: “We can’t set up mobile hotspot because your PC doesn’t have an Ethernet, Wi-Fi or cellular data connection“. Most likely there are problems with your internet connection (no network), so you need to check the connection. 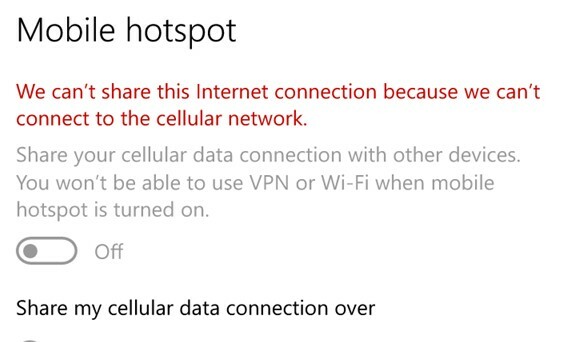 Also this error appears in case you are connected to the provider through PPPoE, this type of connection is not supported by the Windows 10 mobile hotspot. The user passphrase of the hosted network has been successfully changed. “The hosted network started” message tells that a Wi-Fi access point has been successfully started. A new wireless connection named Hotspot will appear in Network and Sharing Center. Now, other Wi-Fi devices can see and connect to this access point. Devices connected to such a network can share documents and hardware peripherals, but the Internet access through such WiFi hotspot is still impossible. 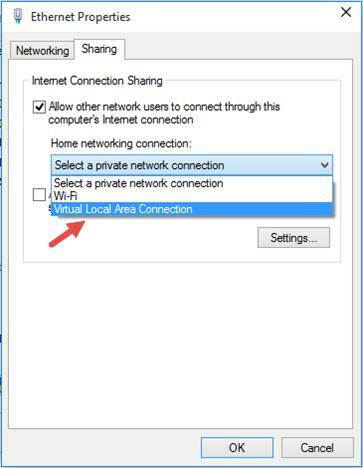 Now you need to allow to use a wired network connection to access the Internet for all devices connected to the Wi-Fi virtual access point. To do it, in Network and Sharing Center click the name of the network adapter, which provides the Internet connection. In our example, it is connection Ethernet. In a network adapter statistics window click Properties. 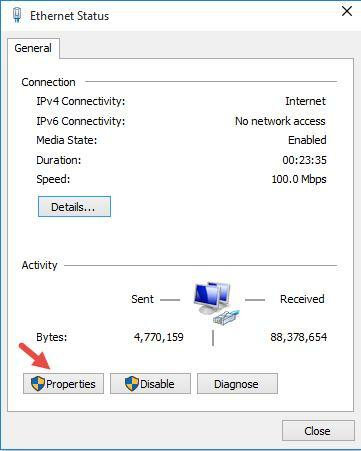 In the network adapter properties window you must share your Internet connection. Go to Sharing tab in the Ethernet Properties window. Check the box “Allow other network users to connect through this computer’s Internet connection” and select the name of the virtual adapter created previously in the dropdown list. Save the changes. In the Network and Sharing Center, the type of Hotspot network will be changed to Internet and that’s mean that this network (and all devices connected to it) now have an access to the Internet . 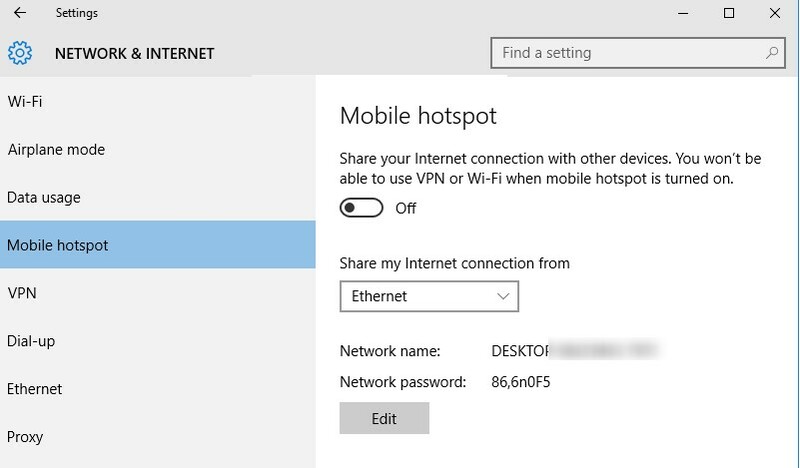 Now all the devices that are connected to the created hotspot on Windows 10 can access the Internet through the external network interface of the computer. Try to connect to your hotspot from your phone, tablet or other laptop. The command displays the network name (SSID), supported authentication and encryption types, the maximum number of devices that can simultaneously use this hotspot (Max number of clients) and the current number of connected clients (Number of clients). The hotspot on Windows 10 can’t work in the hidden SSID mode. Question. After Windows restarts, the Wi-Fi hotspot doesn’t turn on. You don’t need to re-enter the network name and password. Question. When trying to run a hosted network, the error “The Wireless AutoConfig Service (wlansvc) is not running. The hosted network couldn’t be started” appears. and start a virtual access point once again. During the network start, the error “The hosted network couldn’t be started. The group or resource is not in the correct state to perform the request operation” appears. Question. How to check the status and settings of an access point? Question. 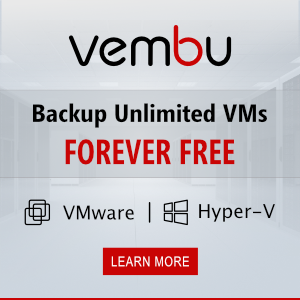 How to temporarily turn off or permanently delete a virtual hotspot? Question. The device connects to a Wi-Fi hotspot, but there is no Internet access. Answer: Check DNS server settings on your device (try to specify the address of the public Google DNS server (8.8.8.8) manually in your client’s settings). Also, try to restart Internet Connection Sharing (ICS) service, or disable and re-enable the adapter through which your Windows 10 computer is connected to the Internet. 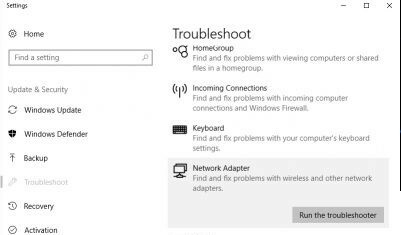 Run the Network Adapter Troubleshooter utility (Network Adapter Troubleshooter: Troubleshoot -> Network Adapter -> Run Troubleshooter). This utility will check the current adapter settings and try to fix the problems automatically. This is the best instruction on the issue I have found, and it worked splendidly. However, after using this for three weeks for so, for some reason it has stopped working. The device (a smartphone) I’m trying to use to access my shared connection does show that it has established a connection, but no data is transferred. This issue has been confirmed on two other devices. Every time I make an access point using these instructions, a connection can be established but no data is being moved – even though these instructions did work well for a couple of weeks. Any idea how so solve this issue? after creating hotspot connections but still does not work? after creating hotspot connections but the internet still does not work? It is impossible to hide the SSID of Windows software hotspot. You can disable WI-FI Broadcast only on hardware access point . In hotspot network supported it says no…what should i do…????? how to set hotspot without password? Thanks a lot for this subject .. My greetings. It seems we should add DNS setting on the client otherwise we could not connect to the Internet. Thank you man! This worked! Tried everything before, but this worked! Had to change the ip to static on the client device and set the google DNS. I have been facing following trouble.what i have to do? The hosted network couldn’t be started.The group or resource is not in the correct state to perform the requested operation. I use this technology to create a private wifi network. In order to manage domain names, I have created my own dns server in order to answer a specific ip to all devices connected to the network. When I start this DNS server on the port 53 on a windows 7 (the one emitting the wifi), the DNS server is automatically detected by the peers on the network and everything works well. However it is not the case on windows 10. Do you any idea why ? Thanks for the excellent guidelines! I did everything, but there was no internet access on any device, I tried few things and at last I disabled the virtual LAN and it disappeared. And I cannot start the hosted network. Any suggestions? Thanks for sharing this brief knowledge about how to create the Hotspot in windows 10. Is there a way to automatically turn on the Hotspot upon booting up the PC? Or run this command from the Windows task scheduler at the computer boot (At startup trigger). I did what you suggested but seems running the .bat file does not trigger to turn on the hotspot upon boot up or just by clicking it. it may have something to do as i’m running Windows 10. Can enable WPS Feature for windows hostednetwork (Soft AP)? Please update if you got any information about it. Something is wrong in this article. 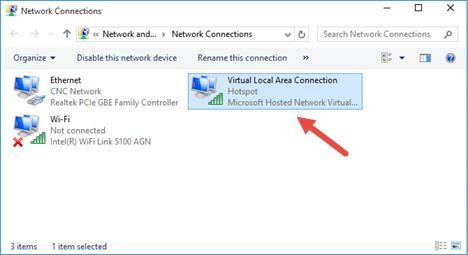 Win10 mobile hotspot is not implemented with hostednetwork. so you can’t enable mobile hotspot with command “netsh wlan start hostednetwork”.